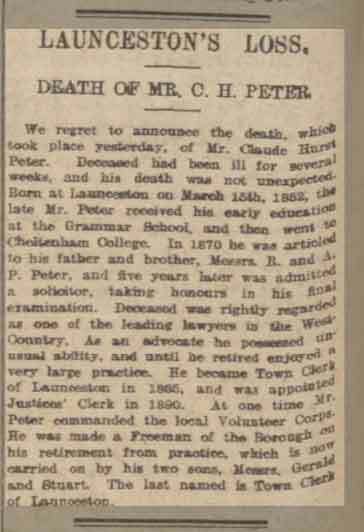 The bio of Claude Peter | Launceston Then! 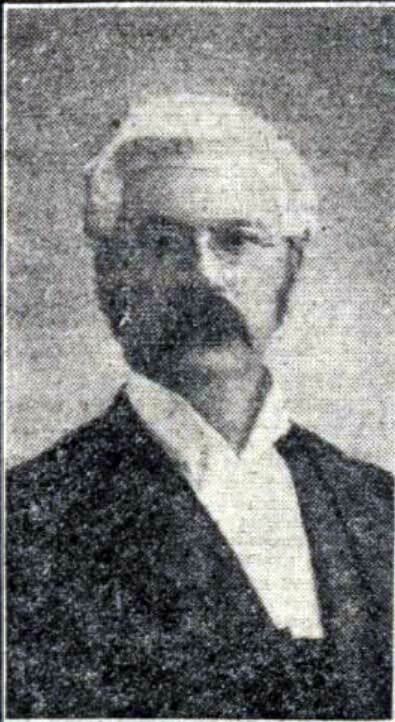 Claude was born on the 15th of March 1852 to Richard and Anne Peter at Launceston. 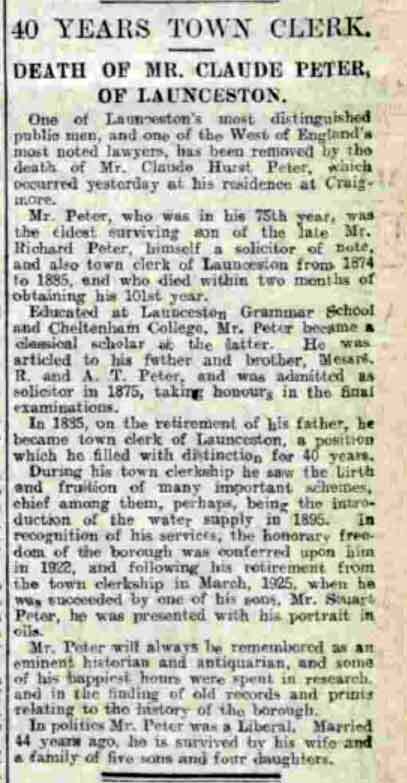 He attended Launceston Grammar School and then Cheltenham College before following into his fathers profession of law joining the family firm on passing out as a solicitor in 1875. At Cheltenham, Claude excelled as an athlete securing prizes for rowing, swimming, etc. He was regarded for his abilities as an advocate and soon became one of the leading solicitors in the West country courts. He was a strong member of the church of England with a liberal belief in politics. 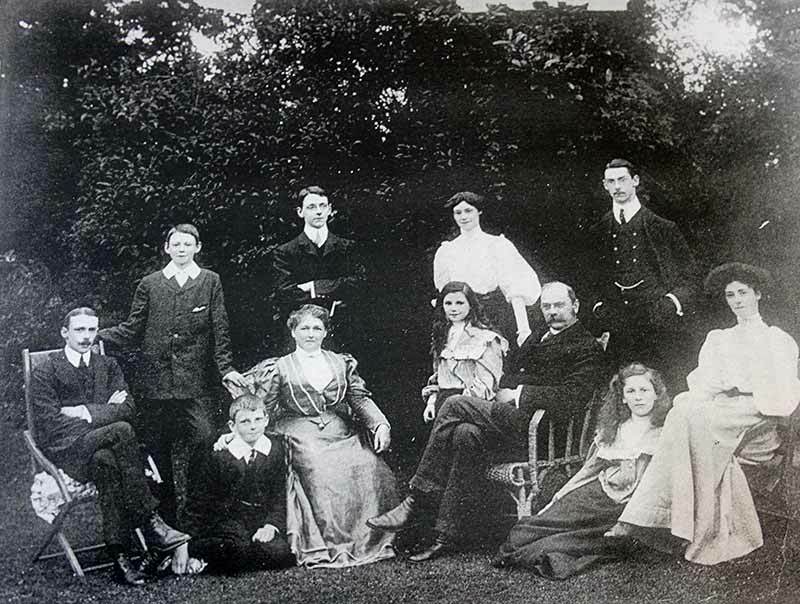 Claude and Matilda Peter with their children at Craigmore. 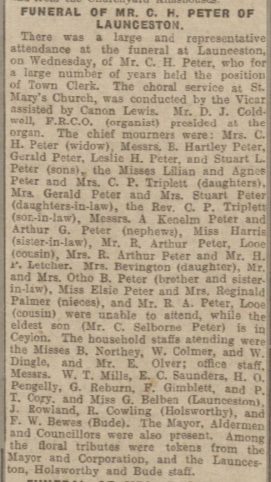 He married Matilda Lucy Barton Harris on the 18th of April 1882 at Sittingbourne, Kent, and together they had 8 children: Stuart Luttrell Peter b: 1882, Claude Selbourne Peter b: 23 Jan 1883 in Launceston, Lillian Peter b: 20 Jan 1884 in Launceston, Bernard Hartley Peter b: 6 Jun 1885 in Launceston, Gerald Peter b: ABT 1886 in Launceston, Agnes S C P Peter b: 1889 in Launceston, Leslie Peter b: ABT 1892 in Launceston, and Katherine Peter b: 1893 in Launceston. 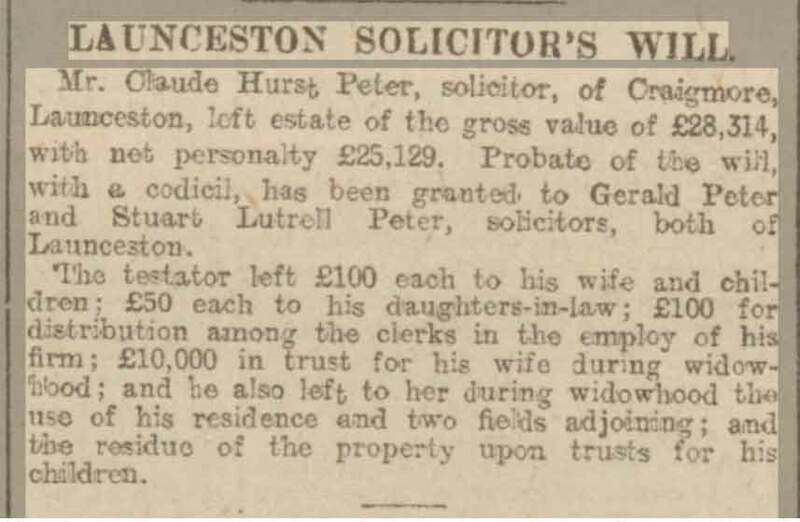 On his fathers retirement as the borough’s town clerk Claude stepped into the role on the 16th of February 1885 retiring in 1926 at which point his son Stuart Luttrell Peter carried on the family tradition of serving Launceston as town clerk. 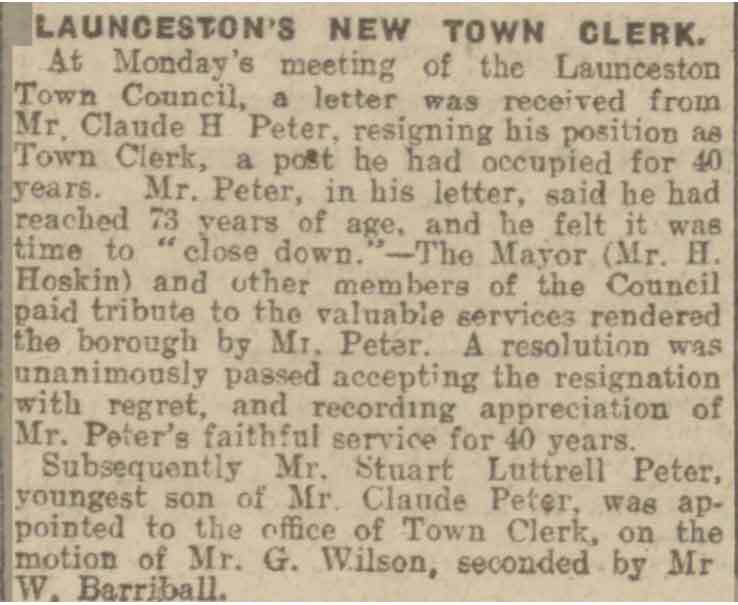 Again following in his fathers footsteps, Claude was granted the freedom of Launceston in 1922 in recognition of his 37 years service as town clerk. Claude Hurst Peter in 1925. The lecture was given in aid of the Dunheved Standard Fund at Launceston Town Hall on 11 February 1907, ‘Fully Illustrated by numerous Limelight Pictures’. The typescript, tied with pink ribbon, is 43pp., foolscap 8vo. With numerous emendations, deletions and additions in manuscript. The first page carries a ‘Syllabus’ of the two topics. Wide-ranging and well-informed, the lecture includes sections on drowning; burning; boiling to death; beheading; hanging, drawing and quartering; pressing to death; hanging; branding; the pillory; the finger stocks or finger pillory; the ducking or cucking stool; the jougs (the Scottish pillory); the stocks; the whirligig; public penance; the drunkard’s cloak; whipping; riding the stang. Ten of the eleven letters responding to Peter’s request for assistance are in manuscript, with the eleventh typed. 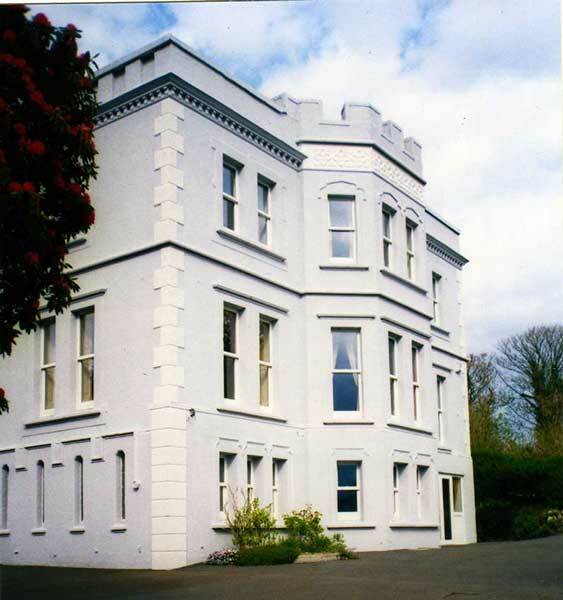 The eleven correspondents are: Robert Barnard, on letterhead of Huccaby House, Princetown, S. Devon; Achille Bazire, on letterhead of 57 Onslow Square, London’; Christopher L. Coulard, on letterhead of Madford, Launceston; H. G. Conor, on letterhead of Parkhurst, Isle of Wight; George Penrose of the Royal Institution of Cornwall; John William Gordon (1853-1936), on letterhead of 11 King’s Bench Walk, Temple, EC; A. E. Hurford of Looe, Cornwall; George Penrose, Curator, Royal Institution of Cornwall (typed); Thomas C. Reed, on letterhead of Wembury, Launceston; ‘Reg’; Alfred F. Robbins, on letterhead of the House of Lord; W. R. Wilson, on letterhead of the Department of Printed Books, British Museum. 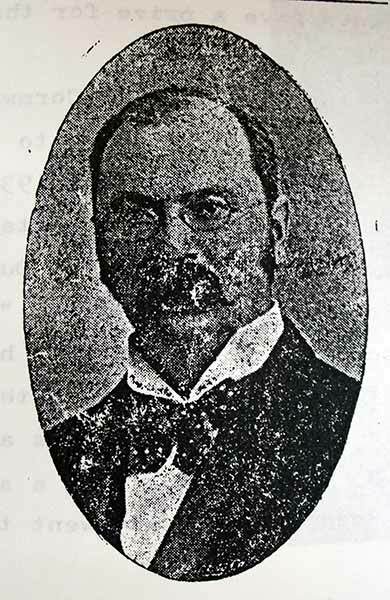 Claude passed away at his home ‘Craigmore’ (above) on the 16th of January 1927 at the age of 74.